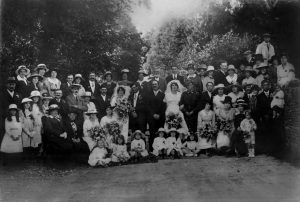 I’d had this photo of what appears to be a double wedding for a few years and decided to see if I could work out who it was. Back in September last year I posted to a genealogy group on Facebook to see if anyone could date it roughly, based on what the people were wearing and the uniforms. In the end there were 92 comments in total with some saying it was around WW1 and some saying it was around WW2 and some saying it looked like it was in Australia whilst other said it could be in England. I had felt, since just after I got the photo, that it was Edward Trew and Ellen Mortimer. The wedding couple on the right were what made me think that – they guy looked like Edward Trew. Military records had previously revealed that Edward had married Ellen in England after spending some time in hospital due to war wounds in WW1. Edward had been wounded in action in October 1917 and spent some weeks in hospital. He had returned to the front in November 1917 and then back to hospital in August 1918 suffering from gas poisoning. 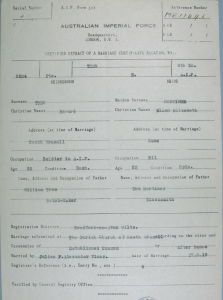 He met Ellen whilst in England (perhaps she was a nurse) and they married on August 27 1919. Some of the discussion on the Facebook page got me doing some lateral thinking. If it was (as it appears) a double wedding then it was quite possible that the two grooms were siblings or the two brides were siblings or one of the brides and one of the grooms were siblings! South Wraxall, Parish Church, Wilt. Edith was Ellen’s older sister and she was married in the same town and on the same date. 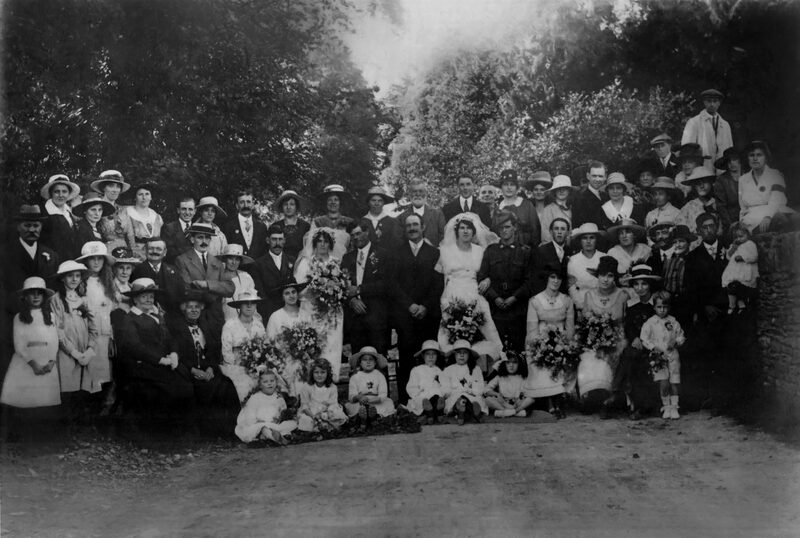 So here is the photo with Edward and Ellen being the newlyweds on the right. The original photo was sepia, so I had my daughter sharpen it up a bit (click the image for full size). I have that photo and some other wedding photos of the double wedding. They are really great. My memory escapes me but I think I got copies off my English cousin when he visited or when i went over there to visit him and his family. Have other older photos too from corresponding with Captain Robert Carr who I am sure has passed away by now as he was an elderly gentleman back in the late 1990’s. Living at Moonrakers. History is wonderful.